What’s with the tone-deaf marketing in gentrifying neighborhoods? A photo of the newly-opened East Village Target, which has gotten backlash for its corporate homage to the neighborhood's past. 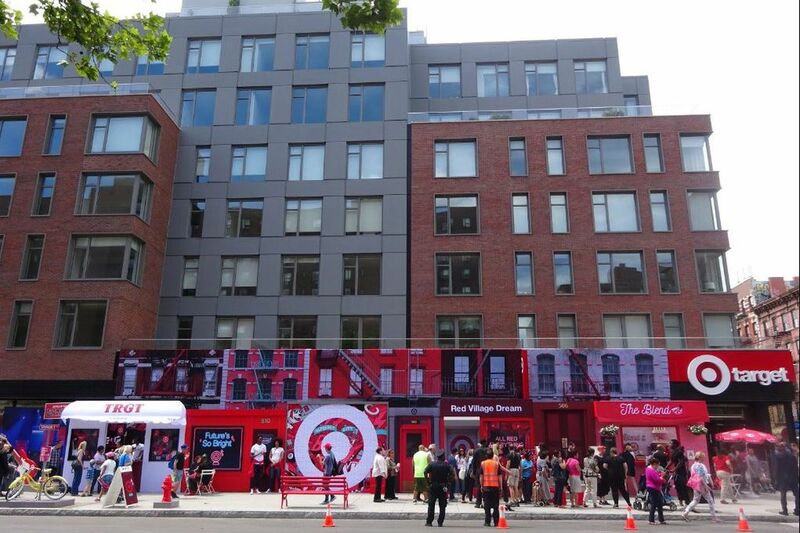 This week, the new East Village Target store in New York City drew ire for a grand opening that sought to pay homage to the neighborhood's past with a mural of old tenement buildings, a hip-hop dancer performing on a fake stoop, and an awning that mimicked an iconic punk dance club that closed when rent got too high. The awning, a callback to the CBGB club, spells out TRGT in a similar typeface. "It's the most deplorable act of neighborhood commodification I've ever seen," said Vanishing New York blogger Jeremiah Moss (a pen name for Griffin Hansbury). "It was almost like a parody." Moss, who has been writing about New York's changing neighborhoods for 11 years, called Target's marketing decision reflective of a trend to "attempt to use authenticity as a way to market" businesses, especially in gentrifying neighborhoods. "The authentic culture of the place gets destroyed," he said. "And the forces that destroy it then use it to sell whatever they're selling to the new population that has moved in." It's not the first instance of a business making national headlines for what many see as tone-deaf marketing choices. A year ago, Summerhill, a Crown Heights, Brooklyn, bar and restaurant, opened with fake bullet holes in the walls and 40-ounce bottles of rosé served in paper bags. Protesters complained to the owner that the design capitalized on racial stereotypes. The restaurant has since painted over the "bullet-ridden" wall (which was where an industrial refrigerator was once mounted) and, with the help of its chef, regained favor in the neighborhood, particularly with black clientele. In Denver, ink! coffee in the Five Points neighborhood boasted on its signs that it was "proudly gentrifying the neighborhood since 2014." Another sign read, "Nothing Says Gentrification Like Being Able to Order a Cortado." The owners said the signs were meant to be cheeky but quickly apologized when met with national outrage. The cafe was vandalized last year but remains open. While Philadelphia has not had such marketing faux pas, real estate agents and developers have long tried to rebrand neighborhoods here, and businesses that signal gentrification — think cafés, cross-fit gyms, and craft breweries — must determine how to engage with the communities they move into. "I think there's a lot of people that don't get gentrification and don't appreciate the true history of a neighborhood before they go in and start making changes," said Ken Weinstein, a developer in Germantown. "I also think to defend some developers, some of the time, that there's a lot of definitions to gentrification, and some people define gentrification in such a way that it's a positive and so their marketing may reflect that." Weinstein said the discussion shouldn't start with how to market a business to a community but what that business should be. "What appeals to the neighborhood?" he said. "You can't just go into a community and be a bull in a china shop. You really have to pay attention to what a community wants." John Schlichtman, coauthor of Gentrifier, which he wrote with Temple University professor Marc Lamont Hill, said there's a way to be inclusive and honor a neighborhood's history with sincerity. "If you're paying homage to a place, that place has people in it, and you need to figure out what's going on on the ground," Schlichtman said. "For instance, the poetry of the East Village. What's the current-day iteration of that? If you're giving a nod to a neighborhood's black history, don't go back to the '80s or '70s. What's going on today? If it's not connected to local people, local organizations, then it's probably empty and hollow, and just a commodification of the neighborhood." Schlichtman held up Hill's bookstore and cafe, Uncle Bobbie's in Germantown, as an example of a new business successfully appealing to longtime residents and newcomers. "Businesses increasingly want to give a nod to particular moments in history that make the statement that this place has some roots," Schlichtman said. They can do that well or poorly. Schlichtman noted that even New York's CBGB music club, in its time, was channeling the reputation of the East Village of the 1980s and 1990s. "They were capitalizing on the grit of that neighborhood and the authenticity of that grit," Schlichtman said. "The just-enough-crime, just-enough-edge to give an edge to that club. That was problematic in that time the same way Target is in this time." Dave Waxman, managing partner of MMPartners LLC, in Brewerytown, said he thinks engagement trumps a marketing campaign when it comes to being a good neighbor. His firm sponsors Little League teams, backpack drives, and a forthcoming field trip for elementary kids in the area to see college campuses. One of the local coffee shops employs foster kids who have recently aged out of the system. A yoga studio offers discounted community classes. "We try to be sensitive and understand that these neighborhoods were here way before we got here," Waxman said. "The nature of the retailers we've brought on are kind of all very woke. They all understand what's happening and that they need to be good stewards."